I’ve been playing with our Nintendo Switch for quite some time now, testing its multiple modes of play, and now I think I’ve spent enough time with it for me to finally talk about it. First of all, the initial set up; it was quite easy for me to use the Switch from the beginning, so easy that I forgot what exactly it was that I did. I just set up my region (chose U.S. to avoid possible issues with the Nintendo eShop), time zone, and created my user profile. I then linked up my Nintendo Network ID (NNID) and it did a quick system update, then was good to go. The games that I initially had (Doom, NBA 2K18, Puyo Puyo Tetris) all needed some updates as well, but were all playable to some extent even without updating so I was able to immediately play Doom right after purchase. I did encounter problems though – I’m probably in the minority but, I don’t have a good internet connection at home right now. I was able to update Doom via our mobile internet, but the NBA 2K18 update is simply too big for this. As of this writing, I have yet to update this title and have been limited to playing six minute exhibition matches with access to changing game settings being very minimal. Later on, I got a copy of Mario Kart 8 Deluxe and it was fully updated right out of the box. This may be a problem for those with similar internet connection limitations, especially when it comes to third party titles. In terms of performance, I’m quite pleased with the Switch. I haven’t played Doom extensively, but my fiancee and I have been playing Mario Kari 8 Deluxe quite a lot recently and have not experienced any noticeable performance issues whatsoever. I did encounter a game-breaking bug in NBA 2K18 while doing a demo at work but I think that’s a software problem that should be fixed once I’m able to download the update. In general, I haven’t had any issues with the Switch when it comes to performance – but note that my last home console was the underpowered Nintendo Wii so I can’t really compare it to the PlayStation 3, 4, or the last two Xbox editions. I bought the Switch with the intention of using it primarily as a handheld gaming console so let me talk about this mode first. I was surprised at how light it felt – it’s supposed to be only one ounce lighter than the New Nintendo 3DS XL but it felt so much lighter than that and I think it’s due to how better balanced the Switch is. Without going into numbers, I can say that the visuals of the Nintendo Switch in handheld mode are impressive enough. The speakers are also quite good; the Switch is much louder than the New Nintendo 3DS XL can ever hope to be. And in terms of battery life, I’ve rarely needed to interrupt a play session due to running out of juice, although I charge the Switch quite often and I’ve yet to go on a long trip for me to fully test this out. It’s hard to talk about controls without factoring in what mode you’re using the Switch in, so let me talk about them now – they are actually quite adequate in handheld mode. Because the Switch is quite wide, the two JoyCon are spaced comfortably far enough apart. 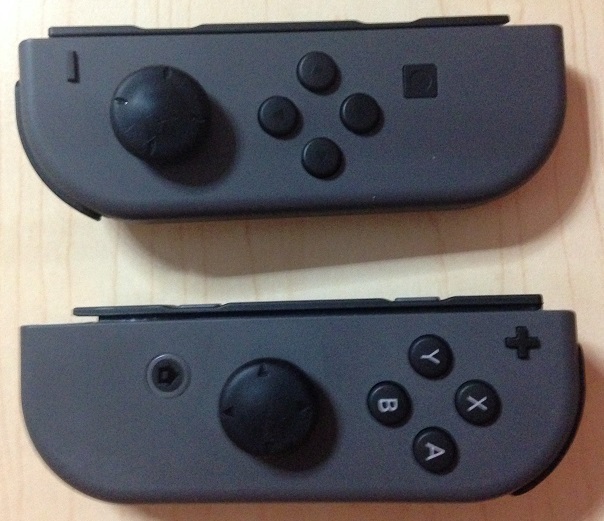 I do have some issues though when it comes to using the right analog stick and the face buttons on the left JoyCon – they’re placed a little too low, resulting in my thumbs stretching out a bit too far down to use them. I’m having trouble playing Doom in handheld mode because of this – the game uses the right analog stick for aiming and this strains my right hand quite a bit. I’m not sure if this just needs getting used to; I feel that I’ll need to play Doom on tabletop or docked mode using a different controller if I want to play it effectively. The right analog stick of the JoyCon is too low for me to be used extensively. 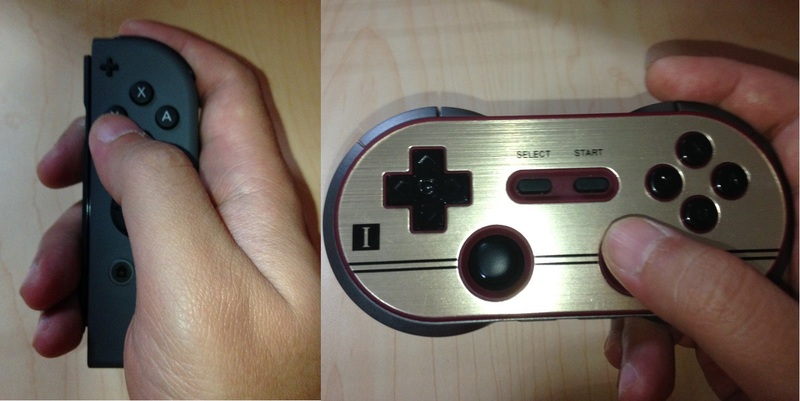 8bitdo F30 controller shown for comparison. The Nintendo Switch’s tabletop mode is what I think is truly innovative and is also quite underrated. I mean, is there a gaming device in existence that will allow you to play home console multiplayer games anywhere you want? Granted, this feature is probably not something that people want in a gaming console but my fiancee and I both appreciate this mode so much – we go out quite often and being able to play co-op games anywhere with a table has been awesome. 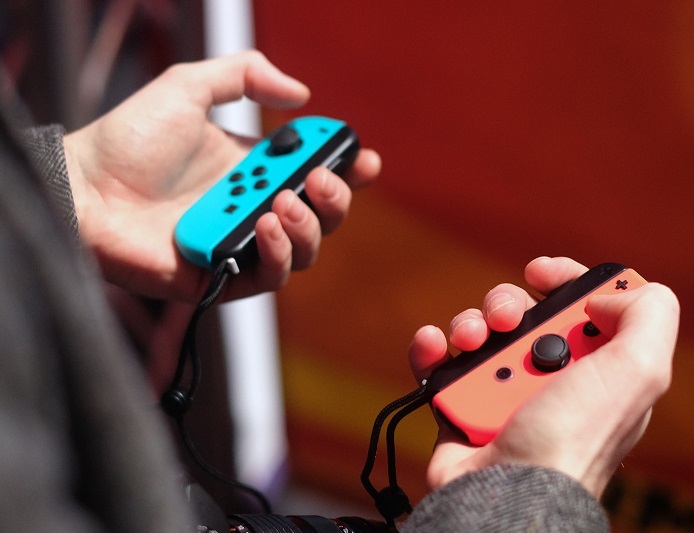 I own a 2DS and a New Nintendo 3DS XL; while owning two 3DS devices allows us to play multiplayer games, we had to settle for watered-down Download Play modes or needed two copies of games that we wanted to play – this isn’t a problem with the Nintendo Switch. Performance-wise, there aren’t any major differences compared to playing the Switch in handheld mode save for the screen size – we’d have to sit close to each other and make sure that the Switch is propped up in such a way that we both had good viewing angles. I have much better vision compared to my fiancee and she did mention that there were details that she couldn’t see in tabletop mode that she could in docked mode; I didn’t have the same problem. However, the built-in kickstand of the Switch works but could have been much better – it fails miserably if you don’t have a flat, hard surface to set the Switch on. And because the charging port of the Switch is located at the bottom of the device, you can’t play the Switch in tabletop mode and charge it at the same time without the use of additional accessories. As for the JoyCon, it does okay as two separate controllers but I wouldn’t recommend this as the primary means of controls. They are simply too small to function as individual controllers and the placement of the analog sticks and face buttons aren’t properly balanced. It’s good enough as a last resort but I’d recommend looking for better options – in our case, we got a third party controller that’s small enough to bring along with us (8bitdo’s F30 Pro Game Controller). The face buttons are too close to the analog sticks, and aren’t centered on the pads. It works, but not recommended for long gaming sessions. With my fiancee covered (she uses the F30), I’m free to use the pair of JoyCon as one controller and my goodness, I think this is another underrated feature of the Switch that people don’t talk about enough. Using two separate JoyCon as one controller is soooooo comfortable! I love being able to play games with my hands/arms in relaxed positions, as opposed to being forced to bring my hands together. A disclaimer though: I still have the same issue with the right analog stick in this configuration so I wouldn’t recommend this control scheme for games that utilize the right analog stick heavily. Finally, let’s talk about the Switch in docked mode. Again, I’m quite pleased with the Nintendo Switch; for me, the device is powerful enough that I feel like I’m actually gaming on a current gen console. I don’t have a PlayStation 4/X Box One, and I never got the chance to play their respective predecessors, so I can’t effectively compare the Switch against its competition. I’m not one to complain about 900p vs 1080p or 30 fps vs 60 fps; I’m good with my current Switch experience. Granted, aside from Mario Kart 8 Deluxe, I haven’t spent enough time with some of the Switch’s bigger titles so I haven’t really put it’s performance to the test. People have mentioned how the Switch isn’t compatible with bluetooth headphones but shouldn’t I be pairing the said device to the TV and not the Switch itself? I guess this becomes an issue when playing in tabletop mode or if your TV also doesn’t support bluetooth headphones. As for control options, everything I said about controls on tabletop mode applies: I’d highly prefer using the JoyCon as two parts of one controller as it’s very comfortable, except when playing games that require extensive use of the right analog stick (I’d use other controllers in that situation instead). I still can’t recommend the JoyCon as two controllers if there are other options; thankfully I was able to get my hands on the 8bitdo F30 controller and am looking to buy a Pro Controller later on. Being able to play games with your hands in any position is an underrated feature of the Switch in docked and/or tabletop mode. In the first month of owning a Nintendo Switch, I can say that I am very satisfied with the device. It performs well enough as a home console, it is awesome as a handheld gaming device, and I’m quite happy that it also works as a portable mini console (tabletop mode) for me and my fiancee. I haven’t tried using the Switch online due to not having good enough internet service, so I’ll reserve my thoughts on that for when I do get to experience it. I also haven’t tried it’s motion controls or the much advertised HD Rumble; later on I may talk about it if it becomes more significant than it is right now. My one complaint about the Nintendo Switch is how it begs for additional accessories; I bought quite a few during the initial purchase and more after, so it feels more costly than advertised. But other than that, I’m glad that I bought a Switch when I did.